Our early arrival afforded us the opportunity to step in line behind just four or five other people to have him sign my copy of Let’s Explore Diabetes with Owls. As I consider what I would like to say to him I observe his interactions with other fans. He has a kind face, he’s making eye contact, he’s engaging the fans, really listening to what they have to say. Full conversations are happening beyond the anticipated: “who do I make this out to? Pam? P-A-M? Oh, two M’s. Okay thanks for coming out PAMM.” Sedaris takes his time with each person. My turn presents itself sooner than anticipated and I look back at Sarah wide-eyed. She shoo’s me along like a supportive mother sending her baby off on the school bus for the first time. I approach the table and before I can think of how to introduce myself he says: “If we were friends I’d call you Boots! So Boots, what’s your real first name?” I giggled and told him that my name is Jessica but he can call me Boots, you know, since we’re friends and all. This little icebreaker made me feel more at ease but certainly was not enough to control the level of grade A awkward that was coming out of my mouth. To this point, there have been three occasions in which I have been able to express to other writers how their work has contributed to developing my own voice as an aspiring writer. 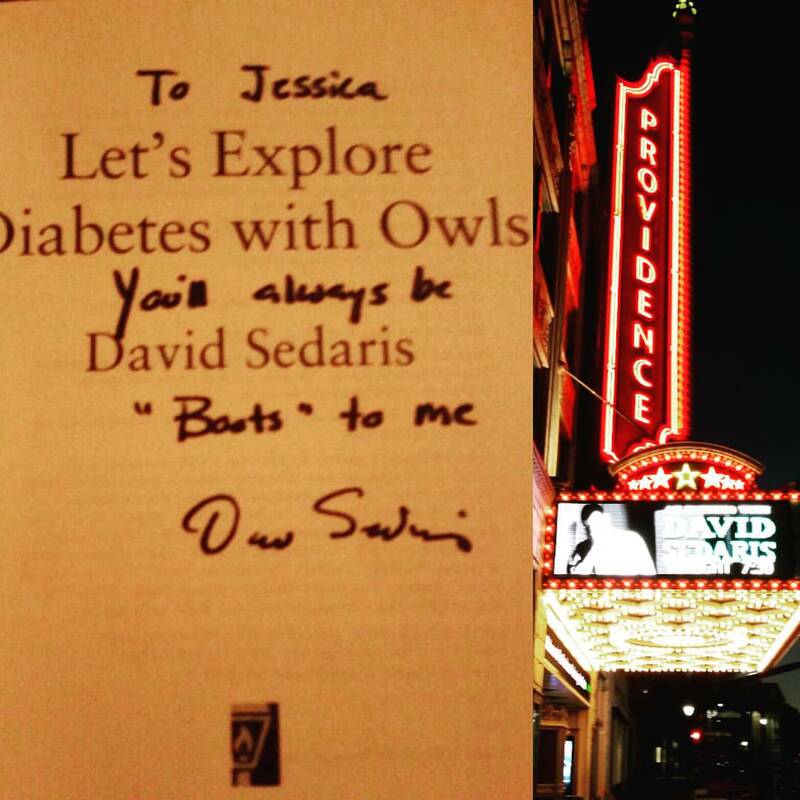 Once through a well-crafted email to Will Schwalbe (where he was all too gracious to return my email with mind-blowing kindness), another smaller book signing with a local author, and now this event with David Sedaris. It’s always weird and voyeuristic. You, a total stranger, gushing over the author’s work and their personal lives (in the case of creative non-fiction). In what felt like a mess of painfully awkward word-vomit, I somehow articulated to David Sedaris my appreciation of his work, how it has impacted me as a budding writer, and how writing has played into living with cancer. I must almost mention that when I drop the ‘C’ bomb on anyone unsuspecting, I tend to totally overcompensate for how serious it is by acting far too casual. In this case I explained my situation in short that I was diagnosed with advanced stage Ovarian Cancer in 2012 and “have just been riding the cancer wave since.” This was accompanied by a wave motion with my hand (oddly reminiscent of Clueless circa 1995). Now, I expected a “thank-you” followed by a polite head nod but instead he asked me if I was writing a book. I explained that it is my ultimate goal to do so and that I have pieces written that are in progress. He then asked me what the name of my book was to which I do not yet have an answer (it may need to be Jess in Boots after this encounter). It was at this point that I mentioned maintaining this blog and the man picked up his sharpie and WROTE DOWN THE BLOG URL. It doesn’t matter if he never visits the blog. I don’t expect him to. The fact that he cares enough to inquire about things that are important to his fans speaks volumes. It only served to reinforce why he is one of my favorite authors. I could write another 700 words on the reading itself but I’ll keep it brief. It was hysterical, exceeded expectations, and included a story of how a stranger removed a fatty tumor from his body that he froze and he later fed it to a sea turtle. Need I say more? You are a blessed human being ~ and don’t be surprised if we think of you as “boots” for a time! just keep those boots a walking girl ~ you’re awesome! I hope he does check you out I know he’ll love this blog ~ I did too! I hope as, “Boots” that you will be able to,”dance with joy!” I truly wish that the, “New Moon” coincides with you feeling better, Jessica! I had to laugh out loud at least twice to this I love reading your blogs ! Sooooo happy to read this! David WILL read your amazing blog! You are, as always, inspirational!